It's a busy week - but I'm still hanging in and getting organized to make some jewelry tonight! 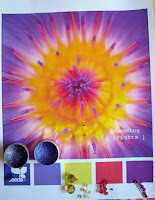 Color Combo Challenge: Want to give it a try? I've joined a color challenge group on Facebook that I think will help to expand my creativity. If you haven't noticed, I tend to stick to some favorite gemstones and color palettes. Judging from this week's color palette, I know this will help me break out of the rut. This weeks colors are called 'blooming brights' and consist of two shades of purple, bright yellow, orange and fuschia (really shades of those colors). A new palette is voted on every week. If you are looking to challenge yourself in jewelry making - or whatever craft or medium you work with - click here to go to the CCC Group (Color Combo Challenge) and like them to join in. the projects yet - and that is as important as the eye candy. from this book for the next 2 weeks (or until the next book comes in the mail!). Yes - I ordered two more jewelry books during Interweave Book Store's Hurt Book Sale. The books may still be on sale (even though I thought the email they sent me said the sale ended on the 12th!) . My new jewelry books should be here soon! I just got this book too! was thinking of trying one of the projects tonight. What do you think of the book? I love some of the advanced projects - I'm not sure of the others. The beginner ones aren't inspiring me. Beautiful Wire Jewelry for Beaders is a wonderful book. Sharilyn Miller is a super teacher. She gives great tips in all her books. I also have Beautiful Wire Jewelry for Beaders 2 by her and Contemporary Copper Jewelry. In my opinion, she is one of the best since these 3 books make it so easy to understand how to do basic things as well as more advanced projects. Am looking forward to seeing your projects from the book. I would like to take a class with Sharilyn Miller. I hear such wonderful things about her. I also like that she has such a great personal style in all of her jewelry. I think Beautiful Wire Jewelry is next on my book list. I should be ready to start a new soon!